All of our Springs luxury apartment communities are pet-friendly, but we understand that your dog is more than just a friend. He's a member of your family who loves you unconditionally and knows just how to cheer you up when you're feeling down. Our generous pet policy allows for almost all types of dogs, even larger-sized breeds, so you're free to choose the one that captures your heart. Find your ideal match among these best dogs for apartments. The French name of this adorable breed literally translates to the perfectly descriptive phrase, "fluffy white dog." Bichon Frises are rarely larger than 15 pounds and a foot tall, making them the perfect size for cuddling. And despite their resemblance to a cotton ball, these dogs are actually bred to be hypoallergenic and don’t shed, meaning they will need the occasional trim. French Bulldogs have distinctive bat-like ears and charmingly rumpled faces. They're compact yet muscular, but have a lower energy level that makes them content to lounge around the apartment. Frenchies are fun-loving and personable but they bark only when necessary, which makes them good neighbors. Weighing in at approximately seven pounds, the Yorkshire Terrier is appropriately classified as a toy-sized dog. Yorkies often top the lists of most popular dog breeds thanks to their feisty but lovable personalities. Their silky coat is closer to human hair than animal fur, so Yorkies are another breed recommended for allergy sufferers. Who could forget Dorothy's faithful companion Toto in The Wizard of Oz? Toto is the most high-profile member of the Cairn Terrier breed, noted for their intelligence and curiosity. Cairn Terriers are playful but patient and tolerant, which ranks them high on the kid-friendly scale. What kid wouldn't love the idea of his or her own Snoopy? 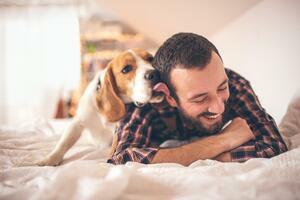 Beagles were originally bred as hunting dogs, giving them a keen sense of smell that they're always ready to follow. It's hard to resist the big, soft eyes of a Beagle, and they consider everyone they meet a friend. Great Danes were bred to sit alongside a king on his throne so their size can be intimidating, but there's a mellow personality hidden beneath. They enjoy regular walks, but Great Danes have no special exercise needs beyond that so they're surprisingly low-maintenance. Just be sure to place fragile items out of the reach of their wagging tail and keep other large breed considerations in mind! Don't let the Greyhound's reputation as a racing dog fool you. The breed has been nicknamed "the 40-pound couch potato" due to their propensity to lie on the couch all day. A Greyhound is happy to join you for a walk or a run then return home. Share quality time with your precious pooch and get to know your neighbors with visits to the off-leash dog parks and pet spas found at each of our Springs luxury apartment communities. Considering getting a dog? Learn more about the application process when it comes to renting and pet ownership before you begin your search.